Yet a crooked fence, an uneven post, or peeling paint all change the appearance of the entire scene…dramatically. Smiles matter, probably more than we realize. Studies confirm the powerful role of smiles in our relationships and on our self esteem, just as romance may spark with a simple smile across a crowded room, and a child’s self worth is partially built through mom’s beams of approval. Salespeople who use the 13 muscles needed to smile rather than the 113 muscles to frown, sell more. In fact, one study recently quantified the monetary value of a smile! Researchers found that in sales situations each genuine smile was worth about $0.43. Regardless of the measure, a genuine, attractive smile bolsters success in every aspects of your life. At Crawford DDS, watching the transformation in patients discovering a brilliant new smile highlights our day. With specialized training in modern materials and techniques, Dr. Crawford holds solutions to correct every imperfect smile. Fortunately, Dr. Crawford has several methods to discuss with you that provide alternatives to traditional braces. These current techniques bring the possibility of a straight, white smile into focus. And it may be simpler than you’ve imagined. 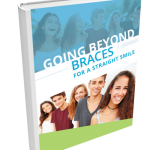 Download our FREE eBook to learn about 4 alternatives to regular braces that can leave you with a gorgeous smile!